GUARDIANS OF THE GALAXY casting alert! Yondu is…..
…. THE WALKING DEAD and SLITHER actor Michael Rooker. 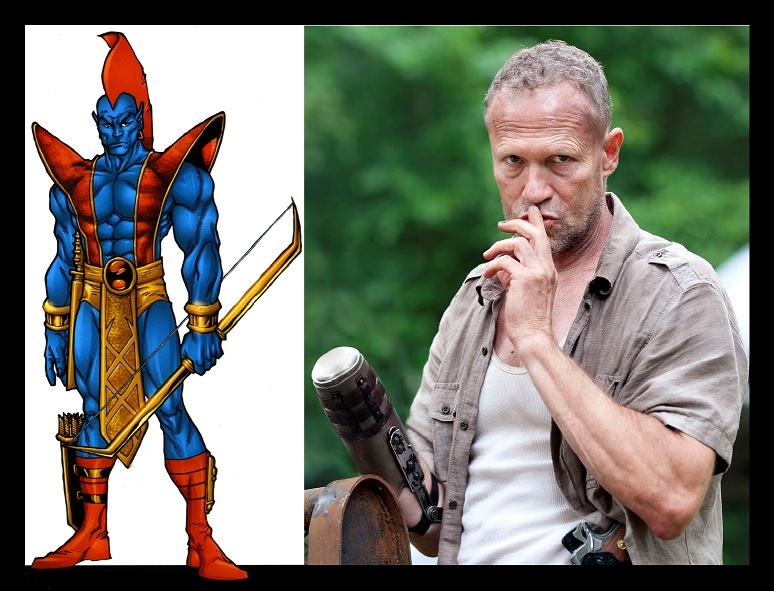 Deadline is reporting that Marvel and James Gunn have signed Rooker to the role of Yondu in GUARDIANS OF THE GALAXY. This is the third confirmed casting announcement for the film with Chris Pratt winning the role of Star Lord and Dave Bautista landing the role of Drax the Destroyer. The role of Gamora is being rumored, though not finalized, for the beautiful Zoe Saldana. Yondu possesses no superhuman physical powers, but is a natural mystic, like his entire tribe. As a member of the alien race of the planet Centauri IV, Yondu possesses an intuitive mystical “sixth sense” perception that permits him limited empathic relationships with other lifeforms. The higher the lifeform, the more limited is his empathic potential. Additionally, Yondu possesses an intuitive and rather mystical rapport with nature, particularly with his own world, but also with any world that still possesses natural wildlife. With this rapport, he can sense incongruous elements (foreign bodies or substances) or focus on specific elements within the whole (such as the location of a given plant). He is also sensitive to mystical beings and forces and is able to detect their presence and activities without effort. By going into a trance, Yondu is able to replenish his own inner strength by communing with natural forces. Yondu is an above average physical specimen of his race. He has slightly more strength and endurance than the average human male. An apprentice hunter, Yondu is an expert in the use of bow and arrow. His ability to whistle with a range of four octaves aids his archery (see Weapons, below). The native Centuarian language is a system of grunts, clicks, and whistles, but Yondu has managed to master the English language, although it is painful for him to speak for too long without resting his throat. He is an excellent hand-to-hand combatant, and a highly skilled hunter and tracker. He has extensive knowledge of the social and religious customs of the natives of Centauri IV. Yondu uses a 5-foot (1.5 m) single curve bow and a quiver of arrows composed of yaka, a special sound-sensitive metal found only on Centauri IV. A yaka arrow can actually change its direction (but not speed) in response to certain high-octave whistle-sounds some Centaurians can produce. It is not yet known precisely what pitch causes a yaka arrow to move in what way. Yondu is so skillful at controlling his arrows, he can cause an arrow to return to his hand or weave its way through a crowd of people without touching them. Yondu’s arrow are 15 inches (380 mm) in length and are very flexible. He carries about 20 of them at one time. He also carried a dagger. Yondu’s right hand was replaced for a time by a bionic device called a weapons concealment appendage, a metal cup replacing his right hand. Thus, he could no longer practice archery nor perform functions requiring him to grasp with his right hand. The device can release from within itself a number of weapons, including a mace, a hatchet, a scythe, a barbed spear, and others; when not in use the weapons are concealed within the appendage at a reduced sized, until enlarged by Pym particles. Later, after discovering that some of his people had survived on Centauri IV and realizing that they would not accept his bionic weapon-hand, Yondu asked the Guardians to use their advanced technology to transform it into a duplicate of his original hand, and they did so. I can’t be the only one to notice the irony of the last paragraph where Yondu’s right hand was replaced with metal cup that contained weapons…. So, what are your thoughts? Are you happy with this casting? GUARDIANS OF THE GALAXY will be directed by James Gunn and so far stars Chris Pratt, Dave Bautista and Michael Rooker. GUARDIANS OF THE GALAXY is set to rocket (raccoon) its way into 2D & 3D theaters on August 1, 2014.